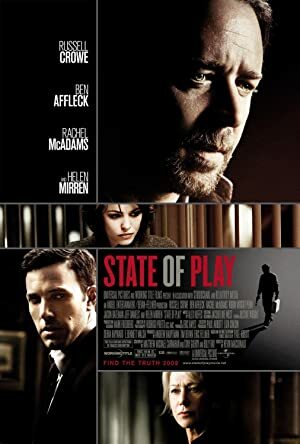 State of Play (2009) – What's New on Netflix Canada Today! A petty thief is gunned down in an alley and a Congressman’s assistant falls in front of a subway – two seemingly unrelated deaths. But not to wisecracking, brash newspaper reporter Cal McAffrey who spies a conspiracy waiting to be uncovered. With a turbulent past connected to the Congressman and the aid of ambitious young rookie writer Della Frye, Cal begins uprooting clues that lead him to a corporate cover-up full of insiders, informants, and assassins. But as he draws closer to the truth, the relentless journalist must decide if it’s worth risking his life and selling his soul to get the ultimate story.